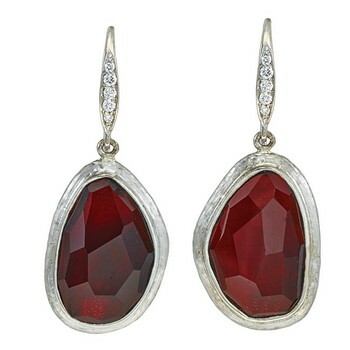 Handmade 18kt white gold earrings featuring 2 faceted Garnet gemstones of 10.54ct total weight. The frame around the Garnets is hand hammered. The shepherd’s hooks have .1ct total weight of round brilliant Diamonds adorning them. This is a Jorge Adeler custom design.